So Hollywood has green-lit a movie called The Six Billion Dollar Man, with Marc Wahlberg attached. Readers of my vintage will recognise this as the latest in a string of reboots of those trashy old TV shows that time grants the unwarranted adjective classic. In this case, it's the 1970's Lee Major vehicle The Six Million Dollar Man, which told how astronaut Steve Austin was critically wounded and subsequently transformed by a shadowy government agency – for the eponymous sum – into a super-powered cyborg; then set loose on an increasingly improbable succession of baddies. Hook line: WE CAN REBUILD HIM. WE HAVE THE TECHNOLOGY. I didn't recognise this at the time – it was after all the seventies and I was only an apprentice nerd – but this show was super-tacky. It rejoiced in zero-budget special effects, of which the most memorable was the way, whenever our hero started to run at super-speed, the action actually slowed down and a tripped-out electronic jangle kicked in, denoting our hero's superhuman power – JH-GH-GH-GH-GH! Which sound became the backing track for countless slo-mo playground punch-ups of the era. JH-GH-GH-GH-GH!! The new movie won't have to rely on such homespun effects. T6B$M is a summer banker in the making and its studio will splurge on the kind of bleeding-edge CGI it takes to lure in the teenage boys and nerds who are the only demographics still willing to fork out for tickets to an actual cinema. This Steve Austin will have an enormous budget – he is, after all, six billion dollars worth of bionic. But stop, wait: how much? Because the only notable thing about this movie is its titular price tag. In 1973, we were led to believe, a shady government agency could pick up a shrink-wrapped bionic man for $6 million. A lot of money at the time but 43 years later that price has inflated by a factor of 1,000. Inflation is running rampant in the bionic superhero market. Why such a price hike? The Planet Money podcast recently explored this question. The PM team pointed out that some categories of goods inflate much faster than others, and they had fun looking around for some basis on which our $6 million might have increased at such a scorching rate. The worst-case scenario they could find was if they assumed that the cost of bionics rose at the same rate as the US healthcare market; but even on this basis, rebuilding a man would set you back no more than $33 million in today's money. More reasonably, thinking of our bionic man (or at least his robotic parts) as a piece of technology, you'd expect his price to have gone way down, given how Moore's Law has crushed the price of servos, control circuits and micro-optics over recent decades. The Twelve Thousand Dollar Man, anyone? In which case how can we account for this stratospheric price rise? Are our shady government friends being ripped off by a global cartel who are distorting the price of machine eyes and limbs? That's Big Bionics for you. Now, yes, I'm reading way too much into this. T6M$M and its newer, bloated offspring are works of science fiction and their makers pulled these numbers out of the air; but what made these numbers sound right to them? I think there's something important at work here. Something that betrays a tension in our relationship to the continuing splurge of technological advancement. Science fiction depends on us finding it credible that some as-yet non-existent technology could at some point come to be. It explores the hypothetical impacts of this fictional tech on people and society. Some law of SF gravity states that these impacts should trend towards either extreme utopia or extreme dystopia, and nothing in between; but what interests me is how we draw this irregular boundary line between things that seems credible and things that don't. This notion of credibility is anchored not only in what's real at the a single point in human history but also on a shared instinct for what's possible. Behind this instinct is a complex system of trade-offs between aspiration and fatalism, a tension that rumbles constantly under the surface of our culture. Take as exhibit A the curvaceous mid-twentieth-century utopias of Hugo Gernsback. That's 'Hugo' as in 'Awards'. Gernsback was the man who pretty much invented the SF magazine in the years between the last century's great wars; and he went on to embody the epoch's peculiarly imperialist form of optimism. The sleek futures he splashed across the covers of Amazing Science Fiction and Thrilling Wonder Stories embodied America's atomic age. And since we’re on the subject of cyborgs, here, from a 1924 edition of Gernsback’s Science and Invention, is a fellow named Homo Artificialis – an early and very nattily-dressed conception of the human-machine hybrid. According to Nas Hedron’s blog, which also goes by the name Homo Artificialis, this dapper fellow may well be the first cyborg in literature; but to me he doesn’t look so different from these pioneering nerds who in the nineties, at MIT's Media Lab, augmented themselves with cameras and CPUs, and a type of high-tech waistcoat they gave the geek-friendly name of MIThril. Themselves they called Borgs. 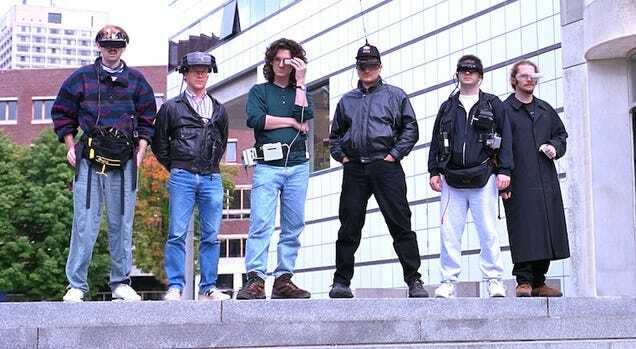 They may look like a bunch of wannabe Johnny Mnemonics shoplifting in Radio Shack but to my eye they still bear more than a passing resemblance to their speculative forebear, Homo A. All they lack is his homburg hat and three-piece suit. The Borgs and Homo Artificialis are just two nodes on a long and broad family tree of human-machine hybrids; some real, some imagined. Somewhere between the two falls Martin Caidin's 1972 novel Cyborg, on which T6M$M was based. By this point the cyborg no longer looked as though he was walking around with a Bletchley Park plug-board strapped to his midriff. Both novel and TV show envisaged a slicker, more integrated mash-up of man and machine than the busy chap with the external food and blood pumps. The organic lines of Steve Austin’s artificial limbs reflected that era's conviction that technology and medical know-how would fully rebuild a man within our lifetimes. As a child of the 70s and 80s, I bought wholeheartedly into that optimism. This was in no small part because my father, Michael Blakstad, was editor of the iconic British TV show Tomorrow’s World. Each week I'd spend half an hour of Thursday evening sitting dutifully on the sofa to watch the show go out live, knowing Dad was across town at BBC TV Centre, calling the shots. I needed to watch closely because I’d be expected to give Dad a post-mortem when he got home – but I didn't need any persuasion. I was gripped. And those years devouring every single episode programmed into me a conviction that dial-up mainframes, robot butlers and domestic hovercraft would all be normal by the time I grew up. Which goes a long way towards explaining why I’m currently working on a novel called This is tomorrow. It's set in the white heat years of the late sixties, and turns a cool gaze on the futurologists of that age. It's part of the Martingale cycle of novels that begins in 2016 with my debut novel, Sockpuppet. To research This is tomorrow I read a number of futurology books written at the time. Some of these were sane and sober, some were potty; but each was certain that the colossal bounds of progress their writers had seen in their lifetimes, from Hiroshima to the moon landings, could only continue. That wonders lay just one or two more stops along the slick monorail of progress. Antigravity belts: If a suitable form of gravity control can be achived, one of the most interesting applications would be for individual lifting devices for individual soldiers. [...] A cheap form of such three-dimensional mobility for individual infantrymen would revolutionise the tactics of land warfare, which would then presumably resemble 1968 tactics even less than the helicopter-borne assault wave in Vietnam resembles the trench warfare of World War One. Predictions have been made that there will eventually be artificial corneas and lungs; "mechanised artificial limbs as versatile as natural arms, legs and hands"; and "electronic substitutes for all the senses, including sight and touch." It seems reasonable to expect that many or most of these predictions [...] will be realised by the year 2000, particularly after 1975–80 when new materials and success with some artificial organs will stimulate doctors and engineers to become even bolder. From where I sit today this optimism looks equal parts enviable and foolish. Since the 70's our hopes for the future have taken a sustained and brutal beating at the hands of oil shocks, globalisation, every stripe of economic boom and bust. Yet at the same time we’ve seen technical marvels that the wildest-eyed of futurists didn't dare envisage. Tomorrow’s World famously failed to spot the importance of the Web, in its enthusiasm for robotics and jet propulsion. Along the way, our rosy certainties about hover cars and jet packs have dissolved. We tend to think of 'technology' as a mass and assume it will all advance at the same pace; but this just isn't so. We know now that some kinds of tech are just very, very hard to do. In spite of making great progress with robotics, we've found it several orders of magnitude more difficult than we ever realised to fuse technology with our own frail bodies, and trigger it on the cryptic firings of our neuronal systems. These days, when we see the most hulking artificial limb respond to the most rudimentary synaptic command, we stand and applaud; because even these limited achievements are mind-blowing. From our present perspective. Take Christopher Capps. He recently posted this video to YouTube, showing himself walking for the first time since he suffered a spinal injury eleven years ago. A wearable bionic suit which enables individuals with any amount of lower extremity weakness to stand up and walk over ground with a natural, full weight bearing, reciprocal gait. Walking is achieved by the user's weight shifts to activate sensors in the device which initiate steps. That's incredible, of course – not to say profoundly moving. And what’s perhaps even more extraordinary is that the exoskeleton's makers, Ekso Bionics, say it will soon be on the market for as little as $100,000. At this price point those shadowy government types could rebuild Steve Austin for a few hundred grand. Except that what Mr Capps' video reveals is not just that a tetraplegic man is capable now of walking; it also reminds us how tentative this motion remains. It's the triumph of arriving at a finish line, only to realise we have several hundred more laps to go. This tension, between possibility and realism, is central to this story – and my seemingly trivial question about the cost of a bionic man touches on something vital. The thing that's been revalued in these TV and movie titles, from $6m in 1973 to $6bn today, is not, of course, a real technology. These sums are in fact a measure of how wide we set the bounds of the possible at these two points in time. In some ways these bounds are set as wide today as they've ever been. The visions of Tomorrow’s World have been outpaced by the break-neck evolution of computing. These days some new piece of magic arrives every fortnight, packaged into a press release from Mountain View, California. Google – or I guess now I should say Alphabet – has billions on hand to fund its dreams of intelligent homes and self-driving cars. The visions of Elon Musk seem copied and pasted directly from the pages of Amazing Science Fiction. Things that were the stuff of science fiction in the 60's are commonplace commodities today. Our phones and watches have outstripped Homo Artificialis – and nobody needs to hang thirty pounds of bakelite around their necks get this functionality. Some would say this makes every one of us a cyborg. But still: the dream of a machine-enhanced superman? Ever more distant. Zeno’s Achilles, in his efforts to overtake the Tortoise, always needed to cross half of the remaining gap; leaving victory ever out of reach. In the same way, with every step we take towards integrating man and machine, we find ourselves ever further from the dream of a man-machine hybrid that moves and soars with superhuman grace. Especially given how demanding we've become in our visions of the future. The surge in technology has raised the bar for our imagination. CGI brings machinery to fluid life in summer blockbusters, from the liquid beauty of the T-1000 to the delicious clack click clack of Tony Stark’s armour assembling itself around him. Hardly surprising that we've raised our expectations over just how cool a bionic man should be. A slo-mo Lee Majors in a red tracksuit, even with flashy lights embedded in his forearm, won't cut it any more. T6B$M will need to deliver bigger and better than even last summer's Age of Ultron or Terminator: Genesys. Our cyborg dreams are engaged in an arms race with the movie studios. So it seems that since The Six Million Dollar Man, we’ve become more demanding – and at the same time more pessimistic – about what it means to fuse ourselves with technology. I think it's these opposing forces of our expectations, possibility and realism, that have together raised the fictional cost of a bionic man several hundred times faster than the price of a tin of beans. This is just as true of a dozen other predicted futures I read about in those futurist tomes, be it weather control, under-sea colonies or anti-gravity (hoverboards, anyone?) To the futurists of fifty years ago, the only question was how many decades it would take for such things to be made real: one? two? surely five at most. Now those concepts seem like naive fictions; or at best, very distant realities. But still we can dream, and we choose to dream big. So you know what? I'll be first in line to see The Six Billion Dollar Man when it lands on some giant screen near me. I don't care how bad the film is. I mean: bionic Mark Wahlberg? Come on! Electronicana is where I blog about culture and tech. Also tech culture. And cultural tech, once I work out what that is.